Migrating animals are often welcomed and celebrated as a sign of seasonal change. Red-breasted robins herald the coming of spring, while the mournful honk of a goose heading south hints at the coming of winter. But there is one animal whose migrations cause fear: the locust. 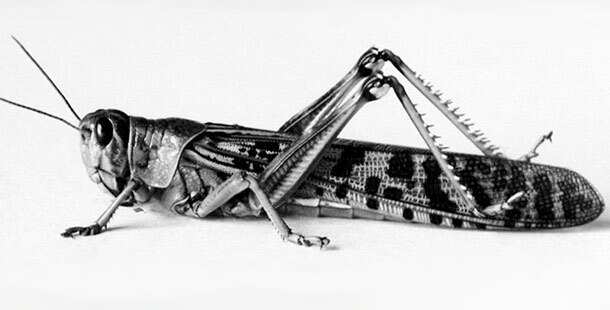 As NATURE’s Earth Navigators shows, locusts look like grasshoppers and are in fact a close relative. But unlike grasshoppers, locusts undergo a remarkable change when their populations grow. At high population densities, locusts may change body shape and size, and then band together into huge, highly mobile swarms that set off in search of food. The changes are so dramatic that researchers once believed that swarming and non-swarming locust forms were different species. For farmers, Farmers fear these swarming pests. In Africa, India, and Australia, swarms have eaten 20,000 tons of grain in a single day. And some swarms can do much more damage: the largest swarm ever recorded contained an estimated 12.5 trillion locusts. It covered several hundred square miles. Such swarms are so big that they are easily tracked by radar. Locust swarms also once threatened farmers in the western United States. In one famous case in 1848, an enormous swarm of long-horned locusts descended on fields tended by new settlers near Salt Lake City, UT. But just when the farmers feared they would face starvation, flocks of gulls arrived, making a meal of the tasty insects. The settlers were so grateful to the bird, called the California Gull, that Utah eventually named it the state bird and erected a monument in its honor in a city square. Today, farmers no longer rely on birds to keep locusts in check. They use everything from pesticides to germ warfare to kill the pests. And they even rely on sophisticated satellites to keep an eye out for the weather conditions that can promote swarming. Still, locusts remain a significant threat to farmers in many parts of the world. When they see the sky darken and hear the buzz of wings, they know a hungry menace is on the move.